In the non-existent contest of which country got the better candied fruit flecked holiday cake, Italy has America beat. Fruit cake as we know it on this side of the pond, is an awful thing. Dense, brick-like, and speckled with unnatural-looking, jewel-toned bits of fruit that more closely resemble stale gummy bears, I can’t think of a single person who actually looks forward to receiving one of these or would ever willingly bring one home. But Italians, well they have panettone. So they win, because panettone, which is soft, airy, fruity in a non-cloying way, and even comes in fun packaging, is, well, awesome. But as great as I think panettone is, I don’t really like to eat it plain. For me, the perfect panettone eating experience includes something creamy like a scoop of vanilla ice cream or a fat dollop of whipped cream or mascarpone. So you can imagine my excitement when I found out that Shake Shack not only had panettone frozen custard for the month of December, but it was only available on Wednesdays, which is exactly what day it was when I stumbled upon the December frozen custard calendar. (Side note: the awesome holiday-themed calendar also included other fun, seasonal classics like egg nog, spiced apple cider, and figgy pudding) Not only was it Wednesday though, it was the last Wednesday of 2010. During my lunch break, I bundled up, put my rain boots on, and power-walked through mounds of snow, lake-like puddles of dirty slush and icy water to go to the Shake Shack in Madison Square Park. 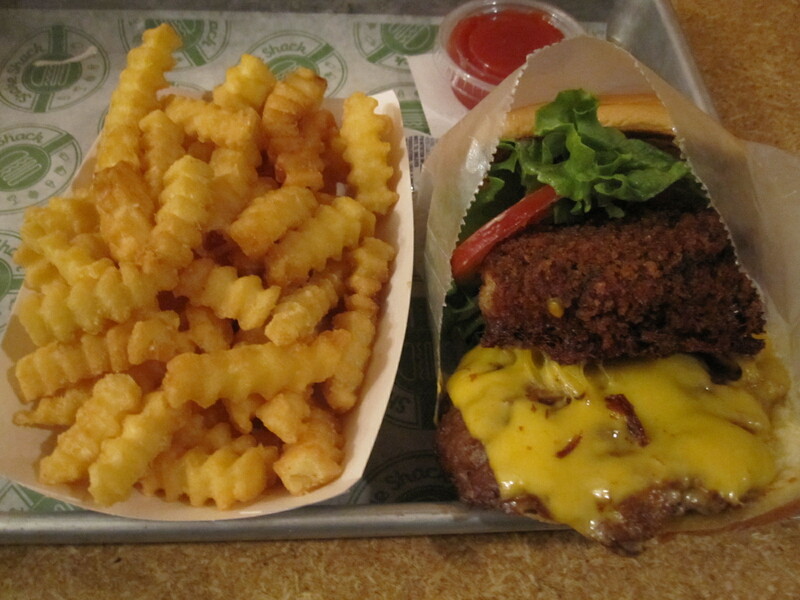 Shake Shack rarely disappoints and this time was no different. 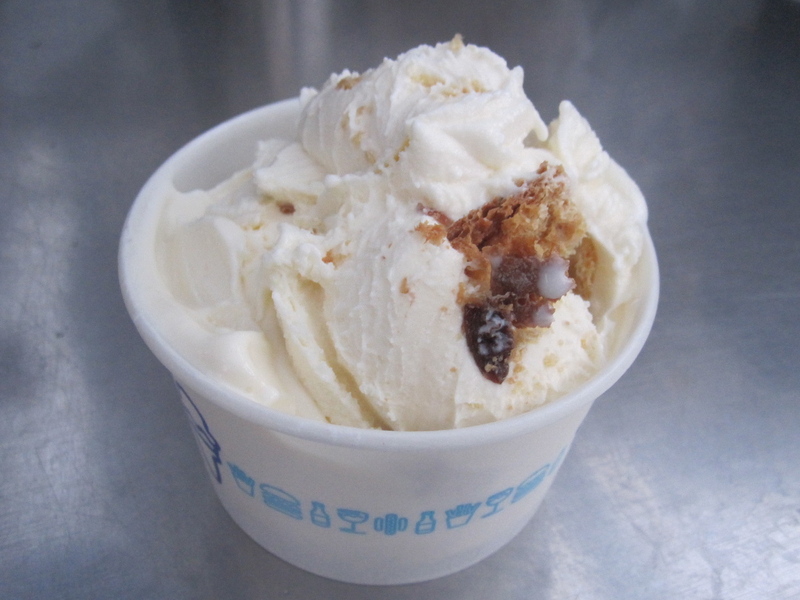 The frozen custard was thick and creamy with the subtle fruity flavor and sweetness of panettone. And instead of gummy pieces of fruit , this milky, cool treat had fat hunks of actual panettone tossed in it, as if someone had torn them off the domed loaf and into the custard. It was panettone exactly how I love to eat it, and being the last time this year that I could possibly enjoy it, what better way was there to say arrivederci? See you in 2011. I grew up with loads of junk food, TV dinners and all things fatty and American. My Italian boyfriend on the other hand, was raised on healthy eats like freshly laid eggs, homemade pasta sauce (never ever the stuff in a jar), and home-produced olive oil. It’s an interesting dichotomy we have going. He’s all about organic produce, hormone-free meat and staying away from artificial sweeteners and MSG. While I’m all for healthy eating, I’m not as committed to the cause. I indulge in many a treat jam packed with all sorts of ingredients that are terrible for me, and I know it. That’s just how it is. But every once in a while, probably because of my bad influence, he surprises me. Of all the things on a menu, he’ll order the one I would least expect him to. 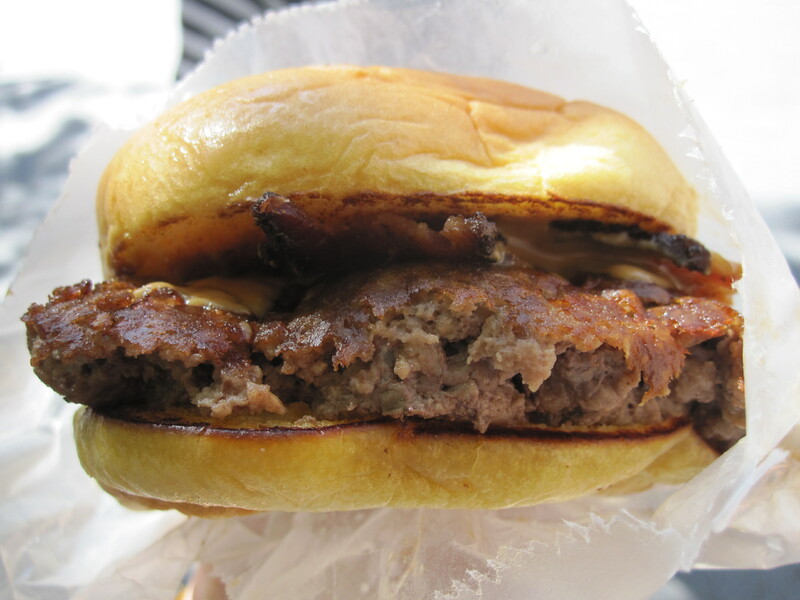 That’s what happened recently when we went to Shake Shack, the always crowded, always smile-inducing delicious burger joint on the Upper West Side. There's a whole lot of deliciousness going on here. I ordered first: an order of fries and a small cup (which turned out to be a pretty large small cup) of frozen custard in the flavor of the day, “Bee Mine” (vanilla custard blended with strawberry puree, honey and rosewater). Then I slid over to let Flaneur order: a Shack Stack burger and a vanilla milkshake. Wait a minute. What’s a ‘shroom burger then? I was stunned. He was a getting a cheeseburger topped with a big, fat, cheese-stuffed Portobello mushroom on it, basically two sandwiches in once! And so much cheese! The only way you're mouth isn't watering is if you're a vegetarian or blind. After waiting and whining about being hungry, then nudging through the packed restaurant, and then staring down people who were done eating and just lingering around, we planted our tray at an open table in the corner. 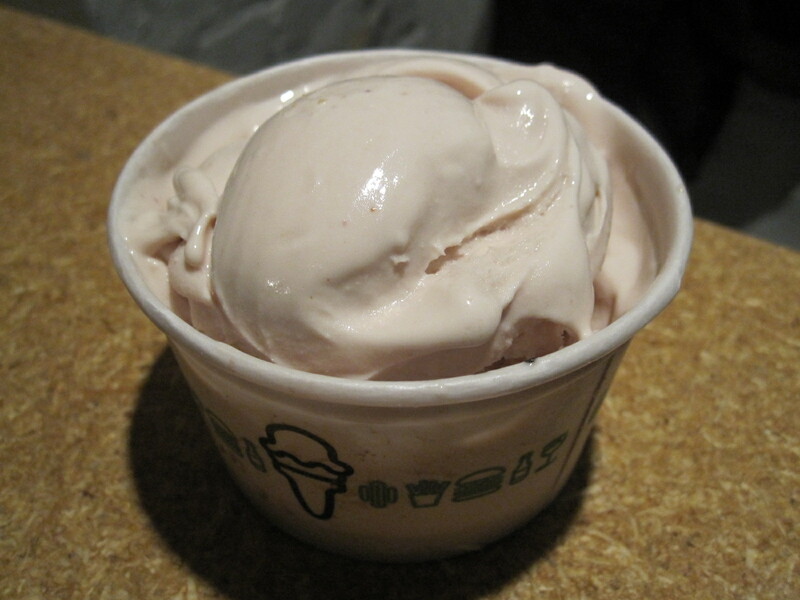 My frozen custard, a wonderfully thick love child of ice cream and soft-serve, was rich and creamy with a nice subtle hint of the honey and rosewater amidst the strawberry. And the color was sweet too: a shadowy pink, not the garish, Pepto-Bismol pink of so many other strawberry ice creams. Flaneur’s vanilla milk shake, made from the same vanilla frozen custard used as the base for “Bee Mine,” was also creamy and dense, much more like something you’d eat with a spoon than through a straw. But it works out better that way. If it were any more liquid, the whole thing would be gone with the first slurp. 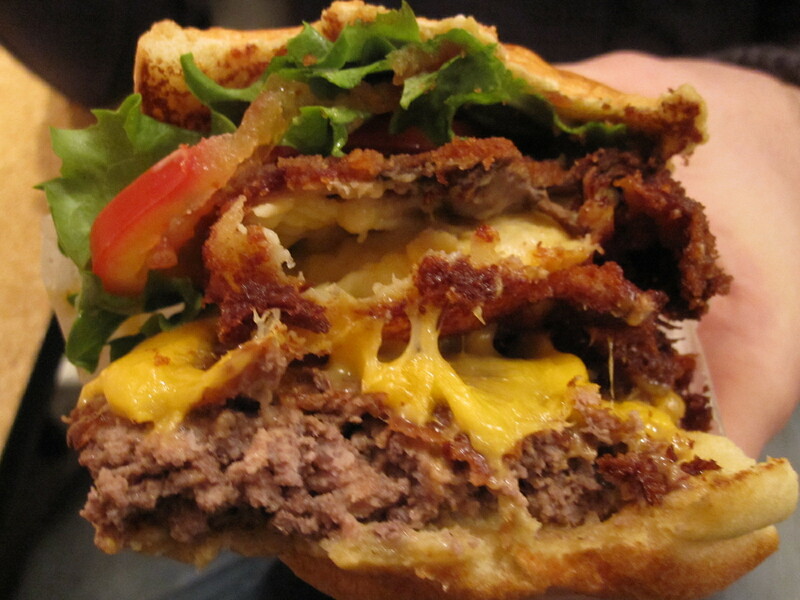 But the star of this show was without a question, the Shack Stack burger. The second Flaneur bit into it, his whole face lit up like a Christmas tree. It was a mouthful of happiness. “You gotta try this,” he said, cheeks puffed out as he continued chewing. I took the burger, not quite sure how to attack it so that I got a little bit of everything. I must’ve looked like a python about to unhinge its jaw and swallow a horse. As I chomped down on the Shack Stack, the warm melted cheese oozed into my mouth and mixed with the juicy patty, the crunchy breaded Portobello and the tomato and lettuce, to make for one of the best burger mouthfuls I’ve ever had. And while it probably packed a mind-boggling amount of calories and fat grams, honestly, who even cares? If my ever-health-conscious boyfriend did, I sure couldn’t tell.